Your average Chicagoan’s architectural expertise likely extends to Frank Lloyd Wright -- perhaps having walked around his gorgeous Oak Park house -- or Daniel Burnham, who created the famous post-Fire plan for the development of Chicago we kinda, sorta followed for a bit. 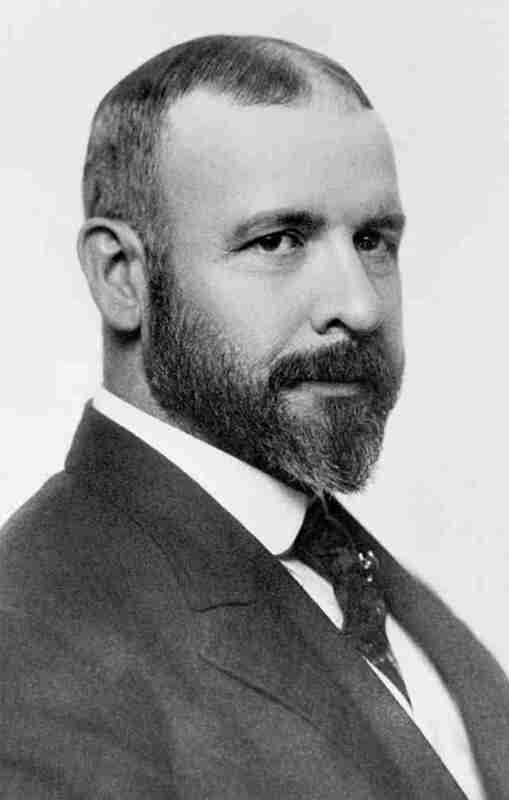 But, predating Wright and Burnham, an undeservingly overlooked name would be Louis Sullivan, who is responsible for pioneering an American form of architecture that broke free from the conventions of the past to embrace his city’s essential newness and modernism. During his height he was the most dynamic architect in the country, and even then he was not fully appreciated in his own time. He had an outsized impact on the future of architecture, inspiring contemporaries and followers alike to push forward and embrace the styles that would come to define our city. Sullivan grew up in Massachusetts, the son of two immigrants, Irish-born Patrick Sullivan and Swiss Andrienne List. With his inquisitive nature and aptitude for sketching flowers and plants, Sullivan was drawn to architecture at an early age. Wandering the streets of Boston in between school classes, he analyzed and admired, or criticized, the buildings of the city. Stumbling upon the Masonic Grand Lodge Temple, he was taken aback by how it stood out against the drab city, and as soon as he learned from a nearby stranger that the building had come out of the mind of an architect, Sullivan knew it was his calling. Despite being only 12 at the time, within four years he would drop out of school and enter MIT, the country's leading training ground for architecture. Even with his obvious aptitude, Sullivan quickly found life at MIT dull and uninspiring. From a young age he had shown a disdain for the discipline and lack of creativity in academic life. He quickly buckled under the boredom of learning about strict “orders” of how buildings should be designed. 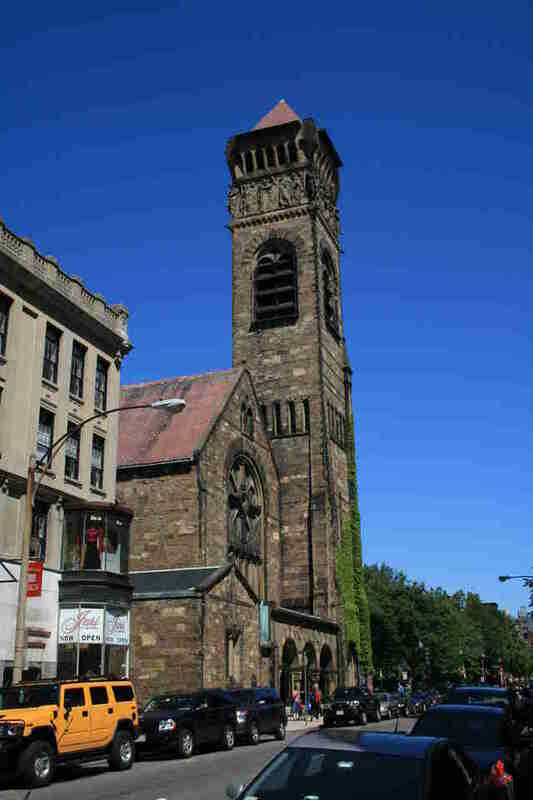 Only one thing he found during this time would move him, the new Brattle Square Church built by a young up-and-comer named Henry Richardson, who would have a large impact on Sullivan's artistic development. Displaying both the impatience and confidence he would later be known for, Sullivan left MIT after only a year and landed a job in Philadelphia with architect Frank Furness. Just in time to settle into his new role, the country was hit by the panic of 1873, which would see commissions for new buildings dry up all over the country. Meanwhile Sullivan’s family had left the East Coast several years earlier for the opportunity of the rapidly expanding Midwest. With the panic killing his chances at more work in the East he boarded a train for Chicago. It quickly became obvious to Sullivan that this city was where he would make his mark. With his aggressive attitude and innovative spirit he had the natural bearings of the classic American pioneer. Still barren from the great fire in 1871, Chicago was wild and raw, buildings were going up in entire blocks all over the city. For Sullivan it was a canvas already bursting with energy and potential. Like in Philadelphia, he would find a building he liked, step up to office that designed it, and impetuously ask for a job. The next week he was back at work. At this point the only thing holding Sullivan back was his education. He was bright and ambitious but had only spent a year at MIT. His new job gave him the benefit of several benefactors who admired his work and were willing to fund his continued schooling. The destination was the Beaux-Arts Academy in Paris, at that time the gold standard of architecture schools. At first Sullivan was impressed by the learned and beautiful designs of his professors, but soon a familiar scene played out. The artificial nature of applying classic design to modern buildings bothered him, and more importantly he felt constrained by the rigid schools of thought that separated structures into different styles. Work was how he would learn, and Chicago was where it would happen. It was upon this return that Sullivan would end up in his most important partnership, with a veteran engineer named Dankmar Adler. Sullivan met him through a mutual friend he had done some design work for after returning from Paris. Adler, who was a master of the technical aspects of architecture, recognized a need for a dynamic and artistic mind to flush out his buildings. 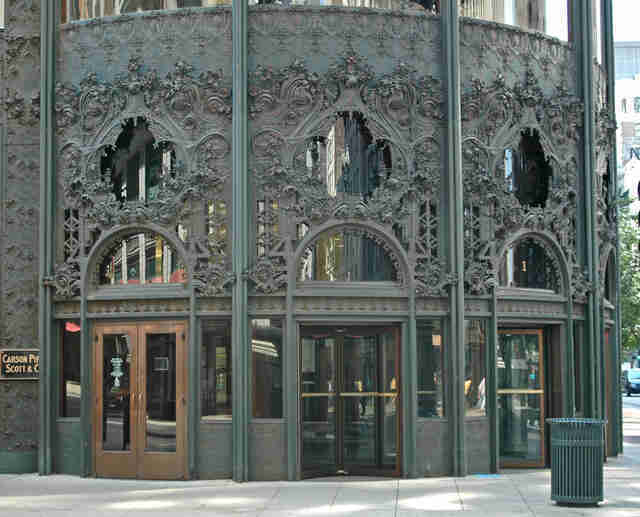 After one collaboration he brought the young Louis Sullivan on as a partner in 1880. It is through this partnership that Sullivan first made his impact on the landscape of Chicago. Being so early in his career he was still struggling to tackle the creative problems he saw in American architecture. 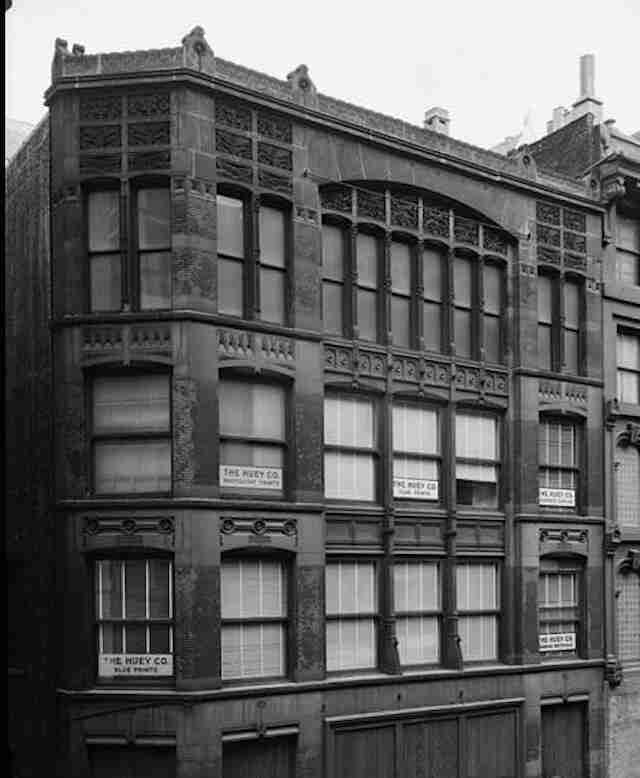 Few of Adler and Sullivan's buildings have survived from this period, mostly private residences which formed the backbone of their business. In them, we see from Sullivan subtle attempts to break free from the faux-classical or overly ornamented style many his contemporaries favored. In particular the Leon Mannheimer and Joseph Deimel homes, on North Cleveland and South Calumet respectively, show the mixture of mostly unadorned masonry work mixed with detailed geometric patterns for ornament that would define his later style. The best remaining work from this early period is the old Jewelers' Building located at 15 South Wabash. 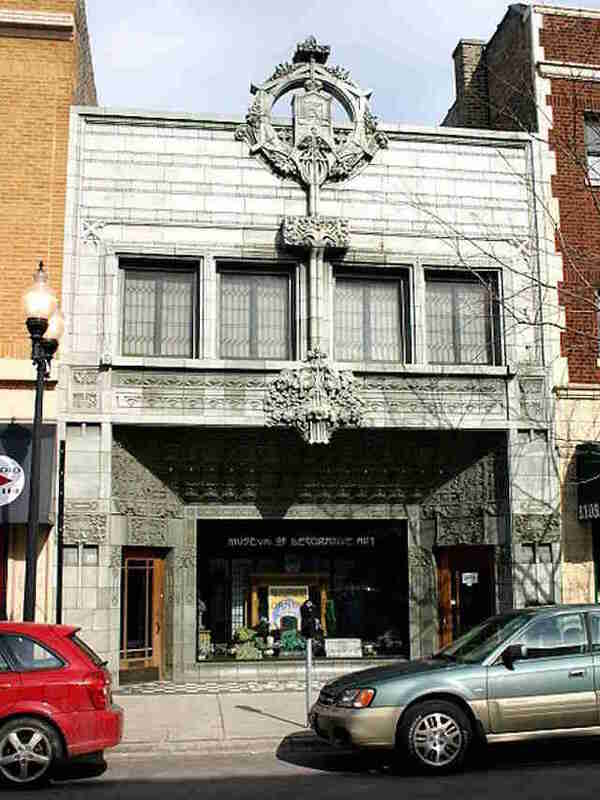 This was the first building of Sullivan's to win him widespread recognition as an architect. Its design is restrained and graceful, meant to reflect the slender designs of the silverware exhibit it was first built to house, and an early example of Sullivan developing his famous maxim of “form follows function.” More innovative for the time was its use of exposed cast iron for the vertical beams not only at the base, which was somewhat common, but all the way through to the top floor. This gave the building a less ponderous feel and maximized the sunlight for the interior offices, which would become a defining trait of modern design. The simplicity of the overall building did not stop Sullivan from topping it with some of his signature patterns, probably the best remaining example of his naturally inspired decorations from this period. Despite these hints towards his future originality, Sullivan wasn’t making all the forward strides he felt were needed. In this struggle he was aided by inspiration from a familiar source. 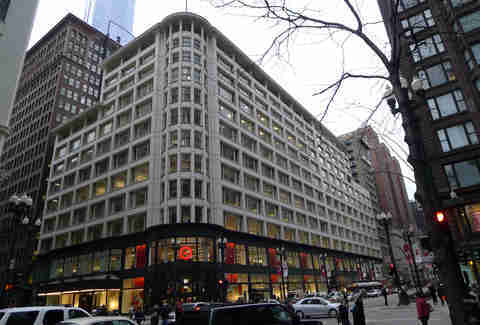 Henry Richardson, whose church had inspired Sullivan way back in Boston, had designed the new Marshall Field's Wholesale Store. 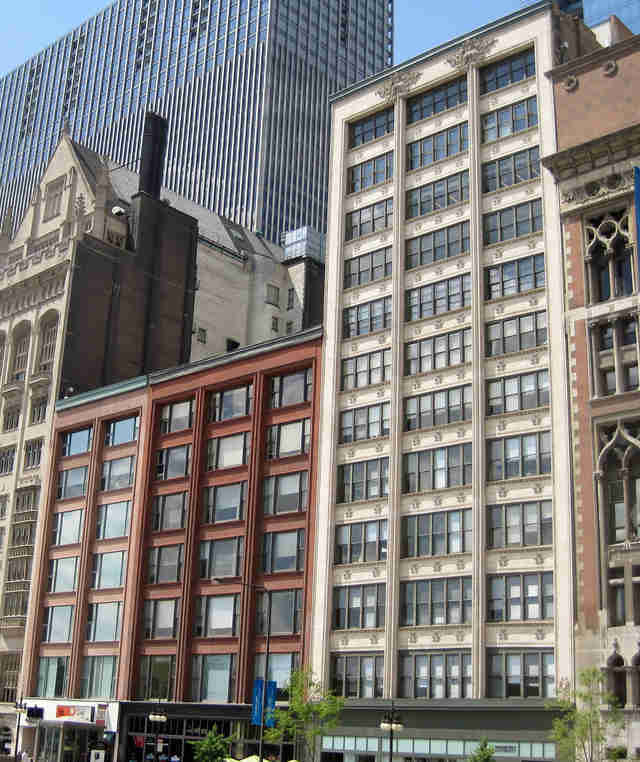 Its un-ornamented facade and unified feel became a landmark for Chicago designers. 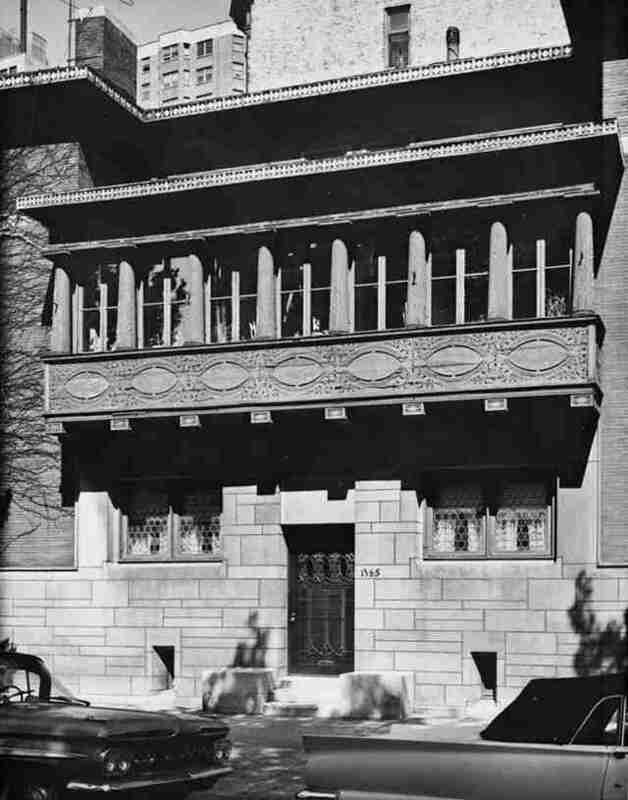 Unfortunately, Richardson died as the building was being built, leaving a huge hole in American architecture, which Louis Sullivan would end up filling with his most monumental work. It so happened that just as Richardson’s Marshall Field's Building was going up, Adler and Sullivan came into their largest commission yet. Ferdinand Peck was a Chicago business magnate who was looking to build a statement theater that would put Chicago on the map next to New York, London, and Paris as a center for high entertainment. Peck had previously used Adler and Sullivan to design a theater for an opera festival and pleased with their work asked them to design what would become the Auditorium Theater. With such grand ambitions they set to work on what would be the largest theater in the world at the time, and the largest building in the United States. 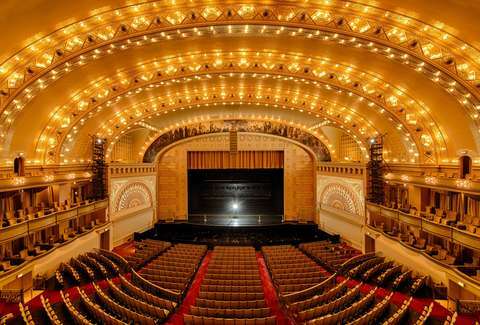 The exterior of Auditorium solidified the monumental simplicity which would become a hallmark of Chicago construction. Heavily inspired by Richardson, Sullivan cut away almost all ornamentation, letting the masonry of the wall and the supporting arches do all of the talking. In order to remain economically self-sufficient the building was designed with 10-floors of hotel and office space built around the theater. This strips the building of almost all the garish embellishment normally associated with theater entrances. Even now being dwarfed by the skyscrapers it stands out for its uniform solidity and massive sense of scale. While the exterior of the Auditorium was a huge step forward creatively for Sullivan, the interior design of the theater is the most memorable aspect of the building to this day. Adler’s engineering skill had resulted in one of the most acoustically impressive spaces in the world. Sullivan gave this design its proper celebration with a blanketing set of five golden arches. The entire room is dominated by patterned designs of hexagons and gold leaf forms, which create a perfect balance of detail to the stately simplicity of his arched designs. The stunning creativity and attention to detail Sullivan showed was not lost on a new employee, Frank Lloyd Wright, who had been hired by Sullivan to help him with the demanding design work of such a large building, and who quickly saw in his new boss the future of truly unique American architecture. After the triumph of the Auditorium Building opening, Adler and Sullivan found themselves at the forefront of a new group of architects in Chicago who were moving towards truly modern forms of expression. The next few years would be the height of Sullivan’s influence as the firm expanded its reach beyond Chicago, and major projects came flooding into their new office. However, this high watermark of his career has been almost completely washed out of Chicago by years of demolitions, but there still stand a few testaments to his vision. One of the most unique works to come out of this time period is the James Charnley House on Astor St. Anyone who has walked past the ornate Gilded Age homes of the Gold Coast has certainly noticed the comparatively distinct and sleek design of this home. A joint work of Sullivan and Frank Lloyd Wright -- it is unclear who is primarily responsible for its form – it’s an undeniable link between the style Sullivan was developing and Wright's later Prairie School. It has the horizontality and geometric design that would come to define Wright, but with a weight and reliance on large swaths of unadorned masonry work that draw heavily from Sullivan style. There are also two smaller structures in Chicago that are great relics from this time in Sullivan’s career. The old Chicago stock exchange building, which opened in 1894, sadly no longer stands on LaSalle. While not as important as some of Sullivan’s other work, its simple design, verticality, and wide windows would be an obvious point of comparison for how much of Sullivan’s style permeated Chicago’s landscape. Thankfully, however, the crown jewel of the building, its ornate entrance arch, has been preserved and now stands outside the Art Institute as a monument to our city’s great creative force. 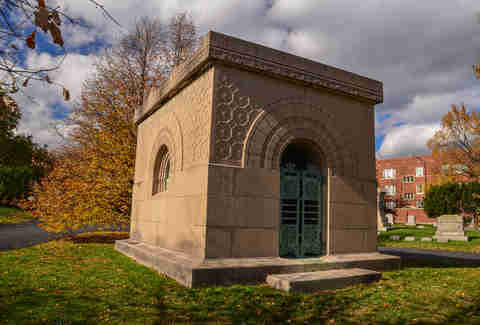 Just as stunning is the Getty Tomb in Graceland Cemetery. This is essentially a piece of sculpture from Sullivan but it shows the genius and refinement of his designs. Contrasting the smooth blocks of granite on the lower half with one of his signature patterns on the upper, and with a gate of intricate bronze, it shows his signature marriage of simple form and dignified ornamentation. Unfortunately for the residents of Chicago, Sullivan’s most important work from this period, and ironically the one that probably had the largest impact on the city’s architecture, isn’t even within our state. 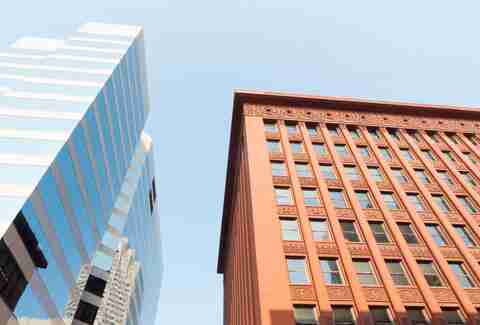 The Wainwright Building in St. Louis was Sullivan’s most important moment of individual creation. Sparked by the possibility of the new tall buildings enabled by steel architecture, he essentially created the template for the skyscraper out of whole cloth. Previous early “skyscrapers” had seen height as an ugly detriment and often grouped two or three floors in different styles to give the illusion of being shorter. The Wainwright design embraced the loftiness of the tall building with an unprecedented seven floors of vertical unity. But he did not abandon his flair for ornamentation, adding unique patterns to each floor and topping the building with a memorable frieze, overflowing with leafy bands. Sullivan had become the first person to truly conceive of the skyscraper as one unit and from that idea gave birth to the country’s most iconic style of building. Tragically for Sullivan, at the height of his powers two major events would cut short his drive to transform architecture. The first harkened back to his early days when the panic of 1893 eviscerated the demand for new buildings when Adler and Sullivan were at their most famous. Second, and more tragically, the World’s Columbian Exposition would alter the course of taste in American building in a way that would all but destroy Sullivan’s career. At first glance the exposition seemed like it should have been the triumphant moment of both Sullivan and the Chicago school of architecture that was growing around him, a chance to show to the world the bold new direction they were taking designs. However the plan for the fair ended up falling into the hands of mostly Eastern architects. Unlike Sullivan these men were still beholden to the Beaux-Arts influence and classical forms. They turned a celebration of Chicago’s progress into a showcase for what Sullivan saw as backwards-looking architecture, devoid of connection to the modern world. As was his nature, Sullivan attempted to rebel, his Transportation Building broke free wherever it could from the conventions being imposed on him. Featuring another one of his breathtaking entryways, for many foreign visitors it was the star of the show. But the damage had been done, businessmen and builders across the country fell back in love with the grandiose designs of the old world for the next two decades. Not long after the disaster of the Columbian exposition, financial struggles stemming from the 1893 panic forced Adler and Sullivan to sever their partnership. Separated from the anchor that had so deftly managed the business side of their firm, Sullivan quickly showed the darker sides of his dynamic but grating personality. Adler had brought an air of cooperation and respect to their business, deftly balancing the artistic impulses of Sullivan with the need of business owners and acting as an amiable intermediary. On his own, Sullivan’s ego and individualistic spirit meant disaster for his business prospect. What little work he could have had was often lost to angry disagreement with potential clients, whom he disparaged as overly conservative and unwilling to think freely. Sullivan’s disinterest in compromising his vision was at the heart of his genius, but in the struggles of the late 1890s it was also his ultimate downfall. Thankfully even in that troubled environment Sullivan managed to leave behind a few last forward-thinking designs that have survived to be witnessed today and stand as a last testament to his status as a giant of Chicago architecture. The respect he had in the field was not altogether lost, and many still envied his flair for design. 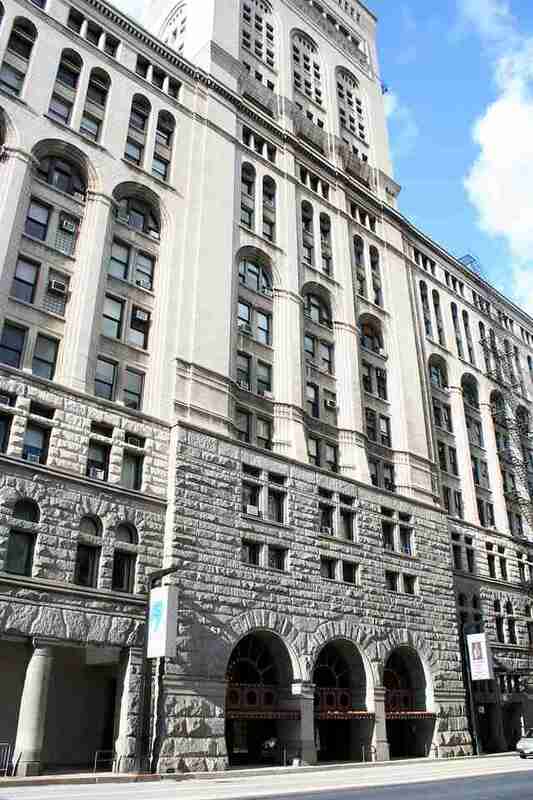 The firm of Holabird & Roche, currently Holabird & Root, who designed the Chicago Board of Trade Building among other city landmarks, commissioned him to create the facade for the Gage Brothers Building, still standing at 18 South Michigan. Here you can see some key later evolutions in Sullivan’s style in his continuing search for a unique American language of building. For the first time, Sullivan put a bigger emphasis on horizontal lines of big windows, a big break with tradition that mirrored Frank Lloyd Wright’s own experimentations at the time. But he didn’t deny the height of the building either as the thin vertical pillars burst into ornamentation at the top of the building to emphasize its reach. 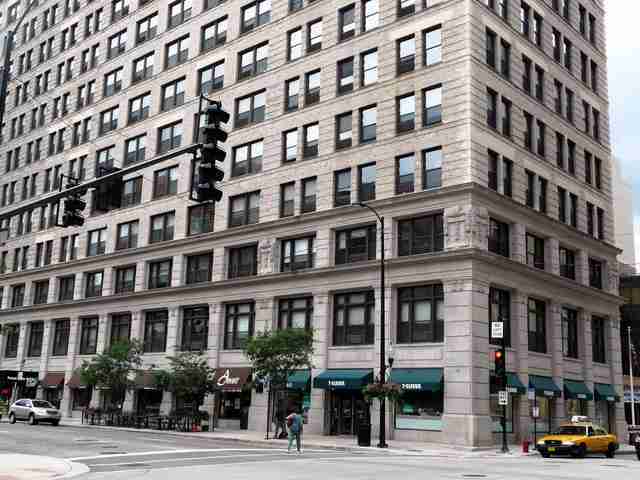 The last great building that Sullivan designed for Chicago is one that still has passersby stopping on the street. The Carson Pirie Scott Building on State is a landmark building for both its clean, open design and stunning ironwork entrance. Making use of the steel-frame construction that allowed a building to carry weight without huge stone bases, Sullivan opened up the interior with huge windows. Like the Gage Building he put strong emphasis on vertical lines by having the vertical columns cut off at each floor, a first for him and unlike almost anything being built at the time. But the showstopper still remains the cast iron entrance with its unmistakable Sullivan floral patterns. It was an extension of his “form follows function” mantra, as it was to symbolize the luxury of the interior department store and draws eyes away from competing retailers on State St.
As the 20th century dawned, Sullivan fell further from the public eye. His spent the last few decades of his career in a state of financial ruin from both lack of work and poor personal management. His defiant personality never gave way, even in the face of these troubles, and he lashed out against the formalized direction so many architects were taking. He continued to work, mostly designing many landmark banks that survive in various Midwestern towns. But Sullivan’s only surviving design in Chicago from the late years of his life was his last before dying in1924, which has thankfully been preserved by the city. It is the humble but beautiful Krause Music Store Building in Lincoln Square. For someone who seemed destined to lead American architecture for a generation it was a quiet end, but one befitting someone whose true impact was only appreciated by the many younger architects of the Midwest who were carrying on his legacy.